This article shall work through some of the statistics found among the examples on the Norwegian Museum website. Upon this website there are close to five hundred examples of Tessak. Around three hundred of whom have full measurements for sword length, blade length and blade width with which to give a fair representation of the sword as found in Norway. In 1604 King Christian IV enacted the “Den norske Landslov”. This was an update of the Norwegian laws and was partially based on the earlier laws put in place by Magnus VI Lagebøte's. A part of this law was the requirement of all farmers to own weapons in accordance with the size of their properties. Starting in the late 1580s King Christian IV had already been importing swords from Germany to supply at cost to his Norwegian subjects and with this law the importation was widely expanded. The most popular weapon was the Tessak (also known as Dussack, Dussage, etc). The Tessak is a basket-hilted sword that had come into being in the 16th century. Originally found in Central Europe it quickly spread through Northern Europe during the century. This sword seems to be an evolution on the already popular Messer. 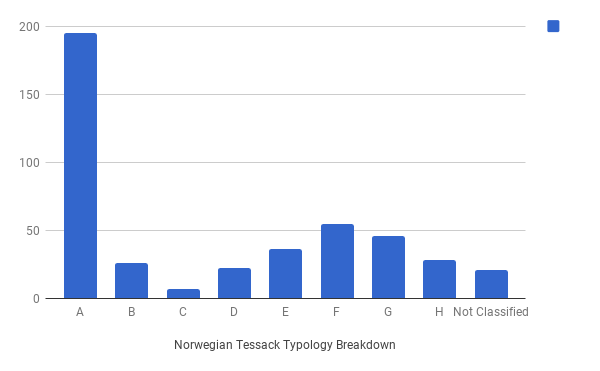 Per Terje Norheim has proposed the following typology for the Tessak. This typology is based upon the hilts of the Tessaks found in the museums of Norway. It is not meant to be an exact typology of all Tessaks found across Europe. There are approximately five hundred swords in the Norwegian Museum archive listed as Tessak. Of these maybe forty swords are misnamed as such and are either later sabre type swords, or earlier messer type swords. This leaves about four hundred and fifty examples of Tessaks in various forms of quality. Unbroken Tessaks with stats: 291 examples. Broken Tessaks with stats: 15 examples. Tessaks with no stats in various conditions: 151 examples. The Tessaks with stats are further broken down into their various typologies. While I might not agree with the Typology assigned to some of the Tessaks by the museums I have not altered them. Somewhat surprisingly based on the stereotype of the Tessak, the Type F is not the most popular type. The Type F is the generic hilt design that one thinks of when thinking of the Tessak sword. Instead the Type A Tessak is the most popular by a large margin. There are nearly as many Type A Tessaks in the collection as there are of all other Types. There are no known reasons as to why this is the case. Using the Unbroken Tessaks we can get the following figures for the Total Length, Blade Length and Blade Width of the Tessaks. The Longest and Shortest lengths for both Total and Blade length are at extremes, but they do show that the Tessak had really no set standard. Rather it seems that the sword was made to the general preference of the owner. When you look at a brake down of the Median Total Lengths of all of the typologies it is surprisingly uniform. Four of them A, B, C and E are at 92cm/36.22" with D, F, and H being just a little longer. G is an outlier by being significantly shorter at 86.75cm/34.15" in total length. There are no good reasons that I know that can explain this large difference. 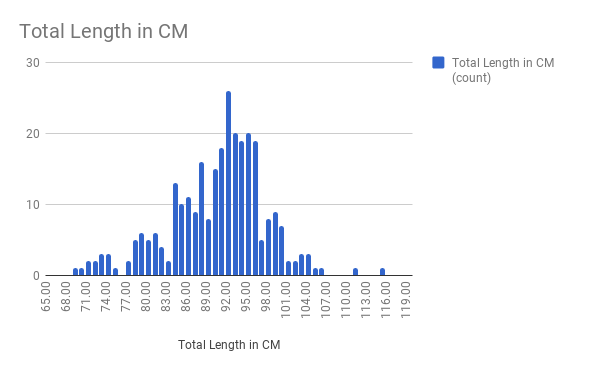 From looking at these measurements it would seem that the Tessak as found in Norway would be on average longer than the general impression of the weapon. There appears to be a feeling that the Tessak was about 81.5cm/32" in total length. As we can see from the above figures, for Tessaks exported to Norway in the late 16th/early 17th century this figure is a good 10cm/4" too short. While there are Tessaks that are in the 81.5cm/32" region they are the minority. For the steel weapon named Tessak at least it would seem that the average length of the weapon needs to be revised upwards. Per Terje Norheim (2000). "Blank Weapons." Weapons in Norway . Indes (Instantly/During) is often a tricky thing to teach to students. Especially with new students who have no prior sporting or martial arts background this can be more difficult. The concept of Vor (Before) and Nach (After) is much easier to explain to them. Vor being about taking the initiative in a decisive and intelligent manner to attack the opponent. Nach describing the position your opponent is now in, forcing them to act in response to your action. Both of these are simple to demonstrate with basic fencing actions. Indes though often is a little more complex. I can tell a student that when my opponent attacked with her Oberhau forcing me into the Nach I chose (in Indes) to defend with a Zorn-Ort. I can show them this, but often I have found that they at the core still remain puzzled. Recently I have changed my mind on how to explain Indes. Instead of using fencing as an analogy I shall use wrestling, Judo in particular as I watch and understand that better than other modern forms. Due to the slower, and larger, movements that occur in wrestling it is easier to see when the competitor decides to act in counter to his opponent. This allows me to show Indes in action in a way that is simpler to understand. Below are some examples that demonstrate Indes very well and clearly. We here at the Atlanta Freifechter strive to emulate the fencing found in the late 16th century. So about 1550 onwards. As well as this we do a more modern style in the form of Italian Duelling Sabre. Our focus for the earlier studies is the Longsword, with the dagger currently being the secondary study. The classes tend to follow a similar pattern of warm-up, rote drilling, active drilling and free fencing. The ultimate goal is to get the new participant a good ground in the basics of fencing to enable them to be able to free fence with an understanding of what is happening. We are safety conscious at the Atlanta Freifechter. It is insisted that good masks, gorget, gloves, jackets, etc. are worn for more active drills and free fencing. All steel weapons need to be burr free, with good flex in the thrust. Strikes to the back of the head, the spine, or the knee are not allowed. Deliberate thrusts to the throat are not encouraged. With all this in mind we still desire good, active fencing. We wish for whichever style we are doing to be effective, and in keeping with the manual/s we are studying. But it is also important that those fencing are having fun, and wish to come back for more. Overall, we wish for our fencers to be well tutored in the skills for Longsword, Dagger and Sabre. To know the theory of fencing, and be able to apply it. Above all though, to enjoy what they are doing.